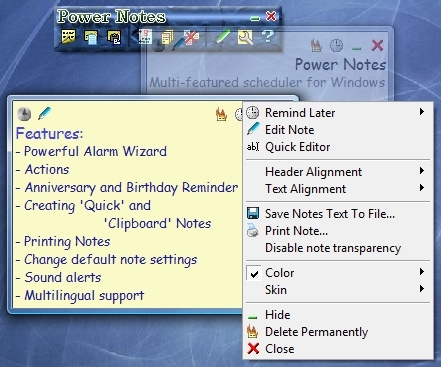 The program Power Notes is a desktop notes organizer, reminder and scheduler for Windows you to create electronic stickers and display them when the time is due. The program is very easy to use and has low system requirements. The scheduler stays in the tray and does not interfere with your activities. If necessary, it can be displayed as a small toolbar on the desktop. All the parameters you may need to change are customizable. Free and great to-do list software with reminder and task lists organized using unique tree structure with icons, suitable both for personal and business use. All to-do tasks can have customized priority level, type, due date. Inbuilt reminder.